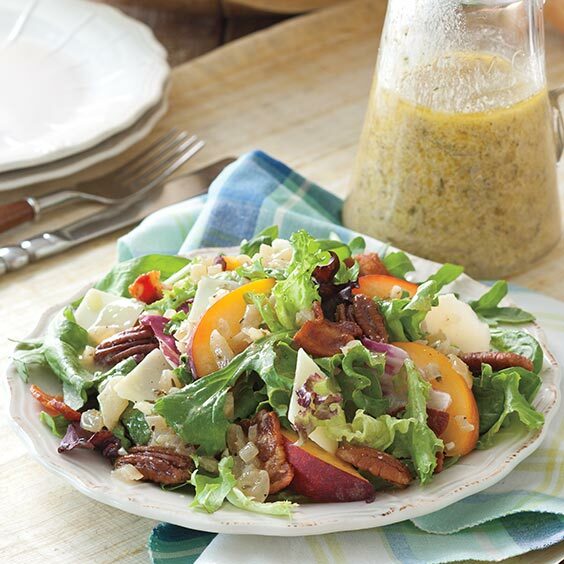 This sweet and savory Peach Pecan Salad with Vidalia Onion Dressing is a great addition to any meal. For dressing: In a medium skillet, melt butter over medium heat. Add onion, and cook, stirring occasionally, for 10 minutes or until onion is tender and browned. Remove from heat, and let cool for 30 minutes. Transfer onion to a medium screw-top jar. Add oil and all remaining ingredients. Secure lid on jar, and shake well to combine. Refrigerate for up to 5 days. For salad: In a large skillet, cook bacon over medium heat until browned and crisp; let drain on paper towels. In a medium skillet, melt butter over medium heat. Add pecans, and cook, stirring occasionally, for 5 minutes or until fragrant and toasted. Sprinkle with sea salt, and let cool. 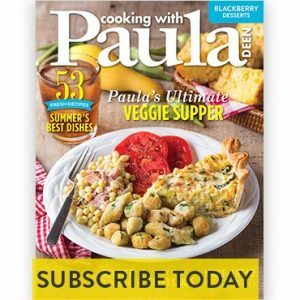 In a large bowl, toss together greens, peaches, cheese, bacon, and pecans. Drizzle with dressing, and serve immediately.